If I could change one thing, it would be the last day. I had one of the best Vegas days ever on this trip, only to follow it up with a step in a steaming turd day. The turd is not steaming. What a kick in the gambol-nuts to do nothing but lose on the last day! I started the day down $600 on an nine day trip - which is totally acceptable, given the comp situation - more on that later. But on the last day I doubled up (down) to -$1200 for the trip. As we say in Flusherville, "That's gambling." Flights were two one-way fares, booked with the last of my Aeroplan points, with some fees and upgrades tacked on - but even with those, they were dirt cheap - a total of $147 to get there and back, plus another $100 or so in train fares. The best part was the return flight which cost me 12,500 points and $5.73 in cash. Take that, Air FU Canada! All my room nights were comped, but Bally's and Luxor clawed back resort fees. It wasn't so bad at Luxor because I got $100 resort credit and $50 free play with the offer. Gambling losses were $1,200. Again, over eight days, I lost $600 - less than $100 a day. And over nine days, I lost $1200. Damn last day. Why, why, why?! I got some really solid freeplay that bolstered the ole budget. There are many ways to 'account' for freeplay. Because I lost on this trip, I will count it as a comp. Why? Because, say I go downtown with say $50 in my pocket. I go to the Nugget, and put $25 in a machine. At that moment, I have... $50. $25 cash, and $25 in the machine. Now, an alternate scenario... let's say I go downtown with say $50 in my pocket. I go to the Nugget, put my card in a machine, and punch some buttons. At that moment I have $50 cash and $25 in the machine. Net difference - well, I think the point is obvious. You could argue that the $25 free play isn't countable as cash. Maybe you're right. But I look at it this way - if I went downtown with the plan of putting $25 in credits on a machine at the Nugget and playing it, that $25 freeplay is $25 I didn't have to put in the machine in cash. They've comped me $25 in credits. Besides, it's my accounting spin and I can accounting spin any which way I want. Nobody is going to audit me. For comps, I'm only going to count the larger chunks of change - in other words, nothing smaller than $10. It totals up to $215. I won't count match plays. It should be noted that I was very conservative with my estimates of comped room costs at Bally's and Luxor. Luxor included a Friday and Saturday night, but I pegged the nights at $80 each. There would have been 12% tax on top of that, as well. The internet tells me that the average cost of a Vegas room night is $127. So, hard expenses of $878 plus $1200 gambling losses = $2078. Net fake accounting spin cost of the trip = $989. Even at $2078 hard costs, I did 'okay' for a nine day trip. That's $230.88 a day for hotel, food, car, and entertainment. Now, just as we obey the Strict Rules of Parlay, we also obey the Loose Rules of Accounting Spin - those flights on Aeroplan points? COMPED. I'm gonna say they would have cost $400 each. (That's USD, Toronto to Vegas). Net fake cost of the trip with full Loose Rules of Accounting Spin applied = $189. What a bargain! I can barely afford not to go! There's another aspect to consider here, which is just kind of a point of interest. Astute readers of this blog know that I have burned my bridges at MLife a number of times by staying on offers and short-playing them, only to have the offers start coming back at some later date. Not only were they throwing out three and four night comped stays with $50 freeplay and $50 to $100 resort credit for almost all the Vegas properties, upon my return, I took a look at my MLife account to see if by chance there was anything left. Now how could I not book another offer of three comped nights at Aria, with $50 freeplay and $50 resort credit? I think Mrs. Flusher would love Aria, don't you? I've never stayed there, but I know some people who have, and they are some of the most trustworthy degenerates known to man. She also likes saying at Steve Dangleshorts Wynn. Duodenum: I just checked MLife to see what other offers might there be. To recap, I had the many resorts/free play/resort credit offer that I used for Luxor for 4 nights. 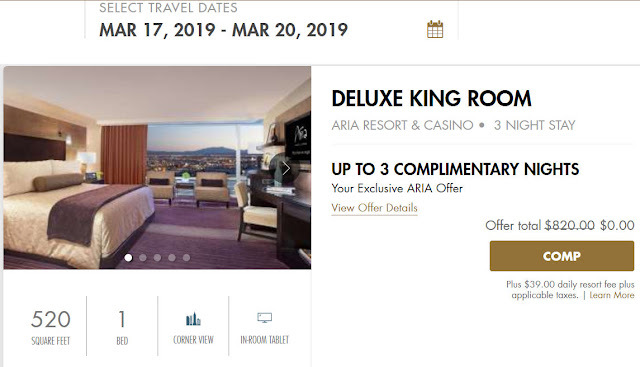 And I've booked another copy of that offer for (ahem) an upcoming possible trip at Aria. Look what's STILL in the hopper! Life is good in Flusherville! I hope the FLUSHER isn't in hibernation.